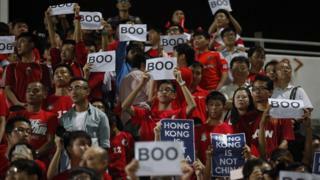 A group of Hong Kong football fans have booed their national anthem - which the territory shares with mainland China - during a friendly match with Laos. Fans jeered and raised their middle fingers as the anthem played ahead of the game, which Hong Kong won 4-0. There has been rising anti-Beijing sentiment in Hong Kong in recent years. In September, China passed a law making it illegal to abuse the national anthem - although the measures have not yet been incorporated into Hong Kong law. Thursday night's match at Hong Kong's Mong Kok Stadium was not the first time locals booed their national anthem, March of the Volunteers. In 2015, the Hong Kong Football Association was fined by Fifa for "improper conduct" after attendees booed and an object was thrown onto the pitch during the World Cup qualifier against Qatar. The latest incident comes weeks ahead of China's 19th Communist Party congress, where China's top leaders will be selected. Hong Kong, a former British colony, is a special administrative region of China. But it has seen increased tensions with the Chinese government following a row over the pace of democratic reform in the territory, and growing calls for independence. HK-China: Football rivalry or politics?